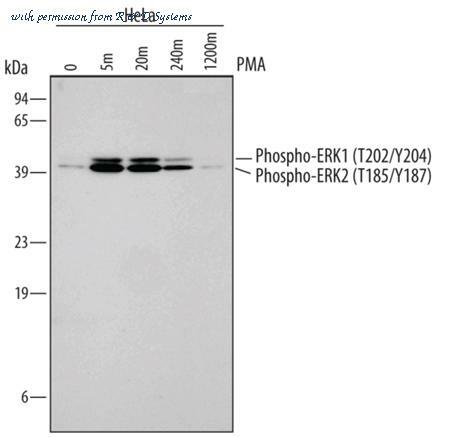 Detection of Human Phospho-ERK1 (T202/Y204) and ERK2 (T185/Y187) by Western Blot. Western blot shows lysates of HeLa human cervical epithelial carcinoma cell line untreated (-) or treated (+) with 200 nM PMA for for the indicated times. PVDF membrane was probed with 0.1 ╡g/mL of Rabbit Anti-Human/Mouse/Rat Phospho-ERK1 (T202/Y204)/ERK2 (T185/Y187) Antigen Affinity-purified Polyclonal Antibody (Catalog # AF1018), followed by HRP-conjugated Anti-Rabbit IgG Secondary Antibody (Catalog # HAF008 ). Specific bands were detected for Phospho-ERK1 (T202/Y204) and ERK2 (T185/Y187) at approximately 42 and 44 kDa (as indicated). This experiment was conducted under reducing conditions and using Immunoblot Buffer Group 1 . 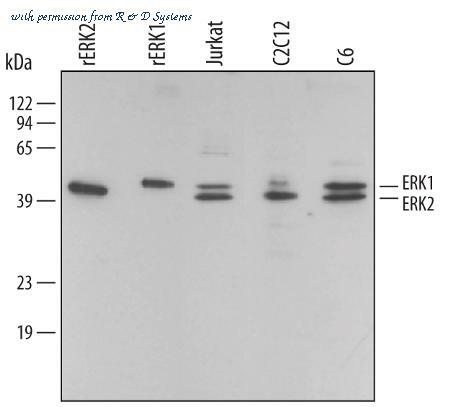 Detection of Mouse, Rat, and Human Phospho-ERK1 (T202/Y204) and ERK2 (T185/Y187) by Western Blot. 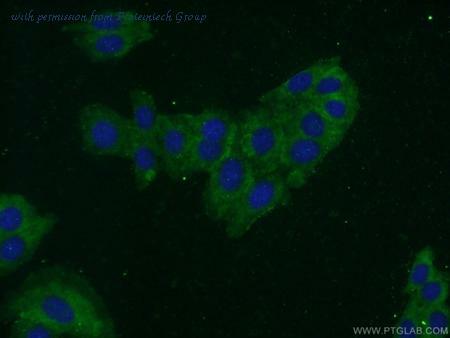 Western blot shows lysates of NIH-3T3 mouse embryonic fibroblast cell line untreated (-) or treated (+) with 100 ng/mL Rabbit Anti-Human PDGF (Catalog # 120-HD ) and PC-12 rat adrenal pheochromocytoma cell line untreated or treated with 100 ng/mL Recombinant Rat beta-NGF (Catalog # 556-NG ) and HeLa human cervical epithelial carcinoma cell line untreated or treated with 200 nM PMA. PVDF membrane was probed with 0.5 ╡g/mL of Human/Mouse/Rat Phospho-ERK1 (T202/Y204)/ERK2 (T185/Y187) Monoclonal Antibody (MAB1018), followed by HRP-conjugated Anti-Rabbit IgG Secondary Antibody (Catalog # HAF008 ). 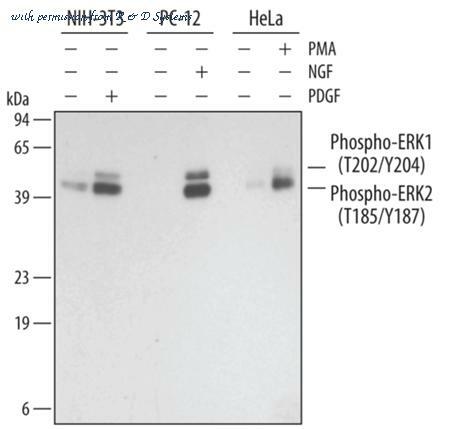 Specific bands were detected for Phospho-ERK1 (T202/Y204)/ ERK2 (T185/Y187) at approximately 40-45 kDa (as indicated). This experiment was conducted under reducing conditions and using Immunoblot Buffer Group 3 . 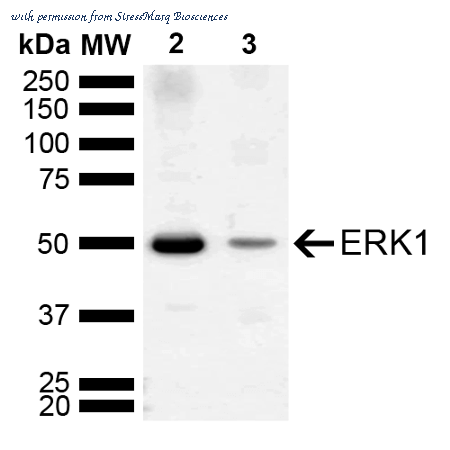 Detection of Human/Mouse/Rat ERK1/ERK2 by Western Blot. Western blot shows lysates of Jurkat human acute T cell leukemia cell line, C2C12 mouse myoblast cell line myoblast cell line, and C6 rat glioma cell line. 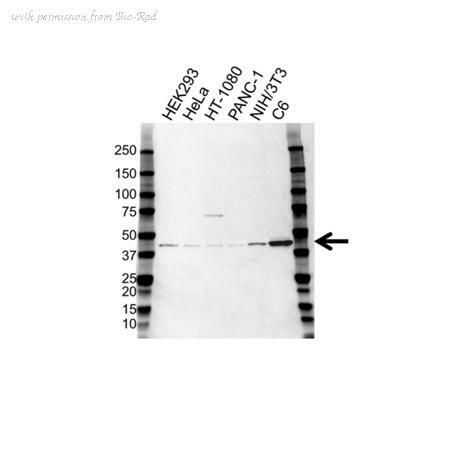 PVDF membrane was probed with 0.2 ╡g/mL Rabbit Anti-Human/Mouse/Rat ERK1/ERK2 Antigen Affinity-purified Polyclonal Antibody (Catalog # AF1576) followed by HRP-conjugated Anti-Rabbit IgG Secondary Antibody (Catalog # HAF008 ). For additional reference, Recombinant Human Active ERK1 (Catalog # 1879-KS ) and Recombinant Human Active ERK2 (Catalog # 1230-KS ) (2 ng/lane) were included. A specific band for ERK1/ERK2 was detected at approximately 44 kDa (as indicated). This experiment was conducted under reducing conditions and using Immunoblot Buffer Group 1 . 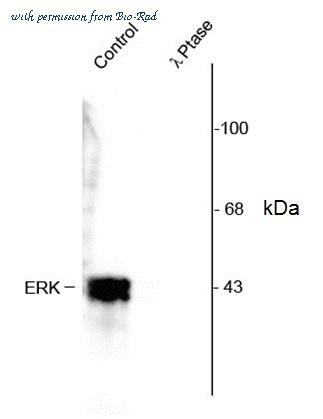 The ERK1/2 antibody from Proteintech is a mouse monoclonal antibody to a recombinant protein of human ERK1/2. This antibody recognizes human, mouse antigen. 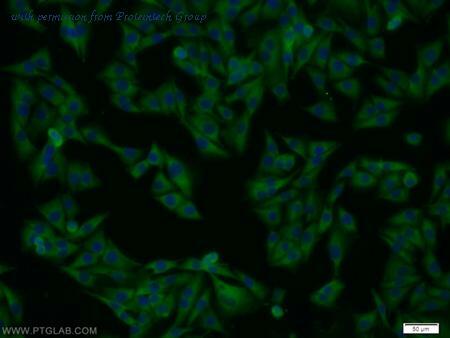 The ERK1/2 antibody has been validated for the following applications: ELISA, WB, IHC, IF, IP analysis. 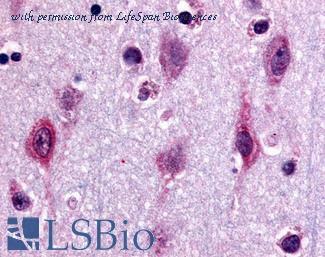 Anti-MAPK3 / ERK1 antibody IHC of human neurons and glia. Immunohistochemistry of formalin-fixed, paraffin-embedded tissue after heat-induced antigen retrieval. 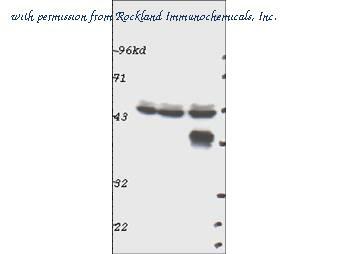 Western blot using Rockland's Affinity Purified anti-p44 MAP Kinase (ERK1) antibody shows detection of ERK1 in whole cell lysates prepared from mouse brain (left), mouse kidney (center) and mouse intestine (right). 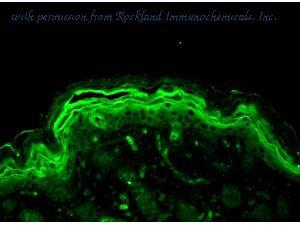 Immunohistochemistry-Paraffin: ERK1 Antibody [NB100-56376] - analysis of human small intestine using this antibody at 10 ug/ml. 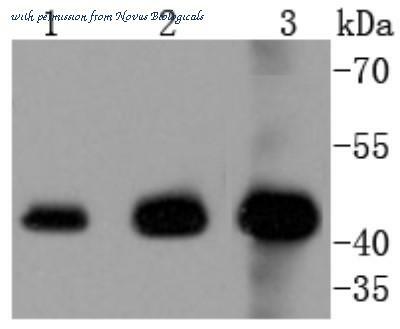 Western Blot: ERK1 Antibody [NB100-56376] - analysis of ERK1 in human A431 cell lysate using NB100-56376 at 1 ug/ml.